Janey and I were in our snowsuits, just outside the pasture, on the Lund’s farm. It was one of those warm winter days when the fog rolls in from who knows where and everything’s white—the trees invisible, the snow-covered cornfields infinite beyond the near fence. I was eight, maybe nine. I didn’t believe her. So I closed my eyes and took a few unsteady steps forward. The thick, damp air cocooned around me, absorbing all but the sound of my heavy footfalls in the snow. My course felt guided by some invisible tunnel heading straight toward the fence posts at the border of the cornfields. After ten sure steps, I opened my eyes. I watched my breath float into the air and join the fog as it drifted past my face. I turned a full circle. “Janey?” I said. But she was gone. Five years had passed. She’d moved out, headed west for college. And there I was, her little brother, stranded in a winter field, wondering how I’d lost her. Need a change of scenery on the front page here, and I love this pink bus. I’m steeped in grad school deadlines, so not much time to dedicate to an accompanying story, but I’ve got an idea. I picture a couple of kids, maybe a brother and a sister, playing at the end of their long driveway, near the roadside. Their father runs a farm, which has been struggling lately, and he’s in a bad mood all the time. Mom has told them to stay out of the way. As they’re playing at the road’s edge, throwing rocks at fenceposts and trying to whistle through blades of grass, they hear the shifting gears of a large vehicle coming round the bend. They stop what they’re doing and stare down the road. A pink bus comes into view. As it gets closer, they hear music blaring from the open windows–something like Bolero, maybe. It goes by, kicking up dust and rattling over the country-road potholes. They watch it crest the hill and disappear over the gradual slope on the horizon. “Was that a pink school bus?” the younger sister says. “It was pink. And it was a bus,” says the brother. “How should I know?” the brother snaps. The girl hangs her head and kicks at the the gravel on at the road’s shoulder. “But it might have been the candy bus,” the boy says. “Why didn’t it pick us up?” the girl says. “Because we didn’t ask it to,” he says. The girl smiles and they go back to playing. The end. I’ve been fairly escape-minded recently, posting images of treehouse communes and private Irish islands on tumblr. It’s the only thing keeping me sane amidst all the dishonesty and cronyism and power-grabbing going on in my state right now. 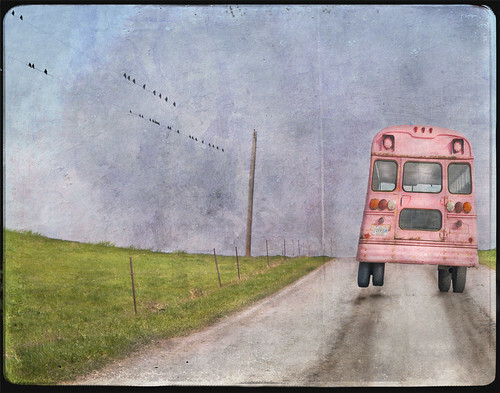 I’d love to hitch a ride on a candy bus to a land where Scott Walker doesn’t exist.